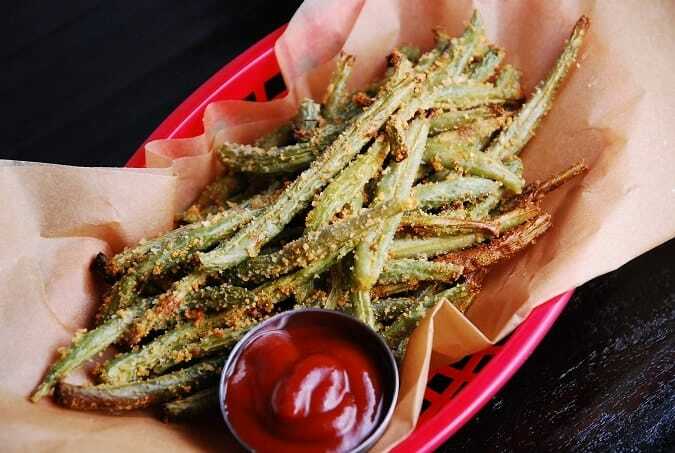 When I first saw this Baked Parmesan Green Bean Fries Recipe on Pinterest a few weeks ago, I was a bit skeptical. But since I adore french fries and am always looking for/experiment with new recipes that offer a tasty and healthier alternative that is low in Weight Watchers Points, I decided to give this a try. I know that the flavor of green beans can be very distinct, so I altered the original version of the recipe I found at Dashing Dish, a bit. And I have to say, the end result was EXCELLENT!! The texture was a tad more chewy than crisp, but the taste was absolutely delicious. I have only tried this recipe with fresh green beans….maybe the texture would be better with frozen? But I made this for lunch one day, sat down with some ketchup, and went to town on these babies. Seriously, they were excellent. This healthy recipe a wonderful way to satisfy my craving for gourmet french fries, but for so few Points. This has become one of my new favorite Weight Watchers Recipes, and I will be making it very frequently. Try them with my Vegetarian Philly Cheese Steak for an amazing vegetarian Weight Watchers meal! A healthier alternative to French fries, these super easy baked green beans are perfectly seasoned with Parmesan and garlic. Slightly crisped, with a delicious flavor, you can serve them with ketchup or your favorite dipping sauce to complete the dish. Preheat oven to 425 degrees. Line a large baking sheet with foil and spray with an olive oil mister, or non-fat cooking spray. In a small bowl, combine the parmesan, Panko, garlic powder and salt and pepper. Place green beans on baking sheet, making sure they are spread out evenly and not overlapping. Mist them lightly with an olive oil mister or non-fat cooking spray. Sprinkle Parmesan cheese mixture evenly over all the green beans. Place in oven and bake for about 12-15 minutes, or until green beans are golden brown and begin to crisp. For those that missed it, there is no oil in the ingredients list, but the directions to say to mist with oil. This is probably the reason ingredients didn’t stick for some and that there was problems with crisping. Not vegan. Do these posters know what vegan means? I don’t understand how this is vegan–it has Parmesan cheese in it! I am sure it is a lovely recipe–but it should be labelled vegetarian rather than vegan. Oops! My bad…I got a little overzealous when categorizing, and must’ve checked vegan! I’ll update it. Thanks for bringing it to my attention.